Big trucks on natural gas? Where’s the gain? The US Senate is working on a new energy bill that would provide up to $3.8 billion in rebates to buyers of natural gas-powered vehicles (get the details here, PDF document). That sounds good at first, because cars running on compressed natural gas (CNG) emit less carbon dioxide than their gasoline counterparts. There’s also the huge benefit of energy independence. Oil is imported, sometimes from unfriendly countries, whereas natural gas is plentiful in the US, with proven reserves that can last for several decades. This is the kind of vehicle that would bring the biggest reduction in CO2 emissions. A Chevy van, a vehicle that comes most often with a low-tech gasoline V8 engine. With a good conversion kit, its carbon dioxide emissions could go down 25% with natural gas. I guess this is what the senators had in mind, as they have specifically set rebates for heavy-weight vehicles. The maximum values of the rebates proposed is as follows. $10,000 for each qualified alternative fuel vehicle with a gross vehicle weight rating of not more than 8,500 pounds; $16,000 for each qualified alternative fuel vehicle with a gross vehicle weight rating of more than 8,500 but not more than 14,000 pounds; $40,000 for each qualified alternative fuel vehicle with a gross vehicle weight rating of more than 14,000 but not more than 26,000 pounds; and $64,000 for each qualified alternative fuel vehicle with a gross vehicle weight rating of more than 26,000 pounds. You read it right, $64 Gs to convert a big rig to natural gas. This is serious money, is it worth it? I think it’s not, because contrary to many people beliefs, big trucks, at least the latest models, have very efficient diesel engines. With turbocharging and a high pressure direct injection fuel system, a big truck is a as efficient as an hybrid car. 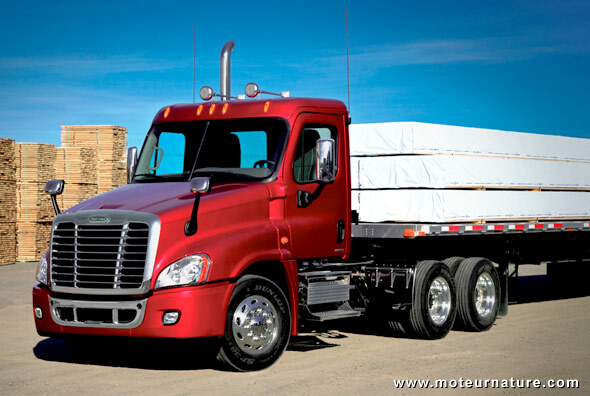 The Daimler group is the world’s largest truck manufacturer, its best models wearing the Mercedes-Benz badge. In terms of pure efficiency, the energy to power ratio, these big trucks are more efficient than a Toyota Prius. Would there be an advantage converting these trucks to CNG? It would reduce Nitrogen oxides (NOx) very significantly, no doubt about it, but it would not reduce carbon dioxide emissions in any way. The debate has been raging for several years in Europe. CNG and diesel are equals in terms of carbon dioxide emissions. You have to find other reasons to favor one or the other.